DIE FRAU OHNE SCHATTEN:Strauss Original Air Date: 12/17/1966 Böhm; Rysanek, King, Ludwig, Berry, Dalis MOD Audio SID.19160212This is the Met broadcast premiere of one of Strauss’ greatest works. 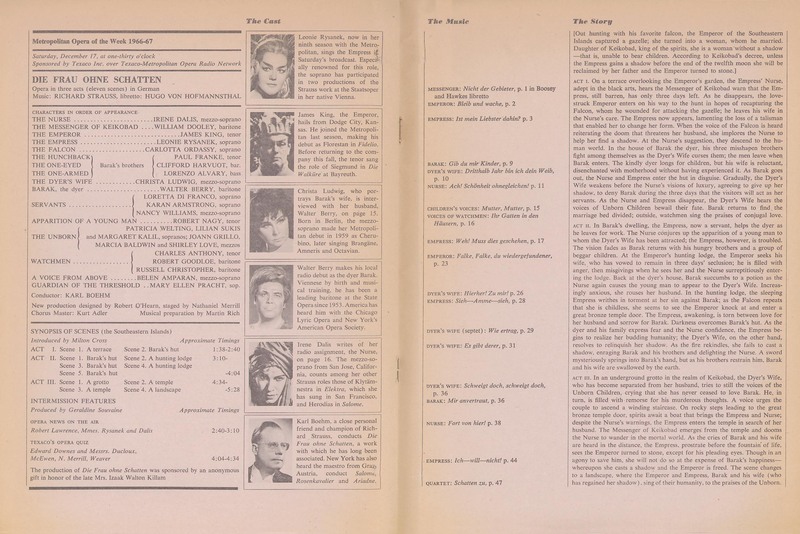 I went to a performance a few … Continue reading "DIE FRAU OHNE SCHATTEN"
DIE FRAU OHNE SCHATTEN:Strauss Original Air Date: 12/17/1966 Böhm; Rysanek, King, Ludwig, Berry, Dalis MOD Audio SID.19160428This is the Met broadcast premiere of one of Strauss’ greatest works. I went to a performance a few … Continue reading "DIE FRAU OHNE SCHATTEN"
DIE FRAU OHNE SCHATTEN:Strauss Original Air Date: 12/17/1966 Böhm; Rysanek, King, Ludwig, Berry, Dalis MOD Audio SID.19160531This is the Met broadcast premiere of one of Strauss’ greatest works. I went to a performance a few … Continue reading "DIE FRAU OHNE SCHATTEN"